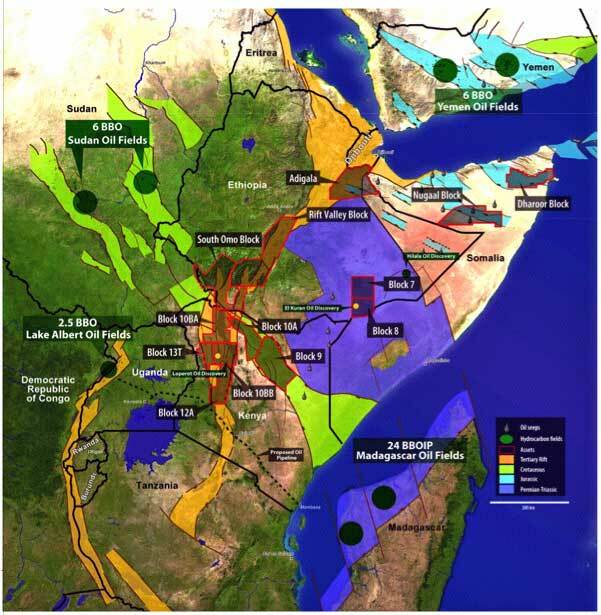 East Africa’s Great Rift includes four rift systems that promise to hold significant deposits of oil. 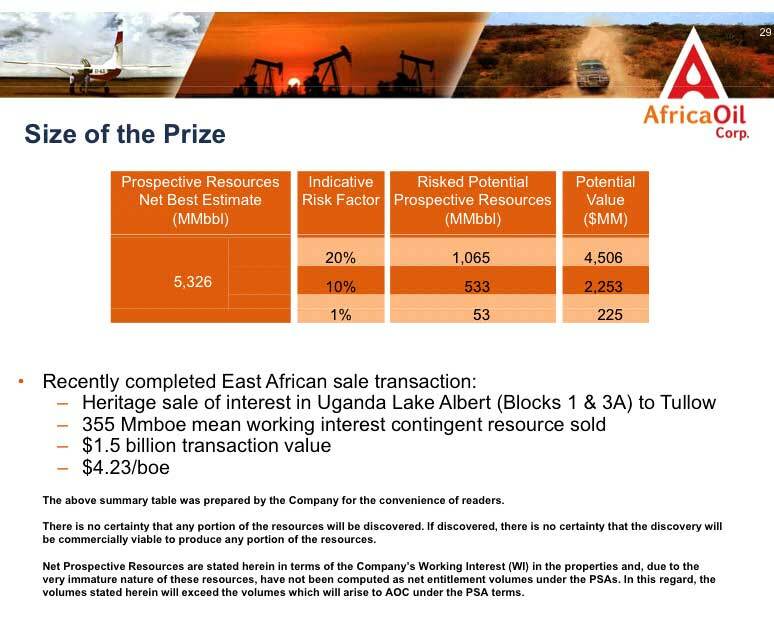 Africa Oil Corporation has been exploring and drilling here, and prepared a report that includes a number of excellent maps and graphics of seismic data. I’ve selected a few to show you here, but you can see them in greater clarity and detail in the PDF report Hunting Elephants In East Africa’s Rift Basins = January 2012 PDF. Four major rift systems in East Africa. The four rift systems from different geologic time are illustrated above and below. You can click the maps to enlarge enough to read. 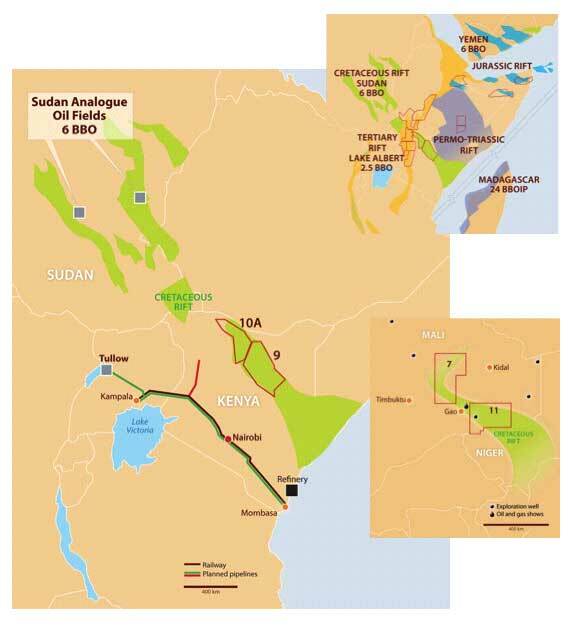 Tertiary Rift Uganda Kenya Ethiopia: Tullow's Uganda discoveries now at 2.5+ billion barrels of reserves. Tertiary rift in Kenya/Ethiopia contains the same source and reservoir system as Uganda as confirmed by Leperot discovery by Shell in 1992. 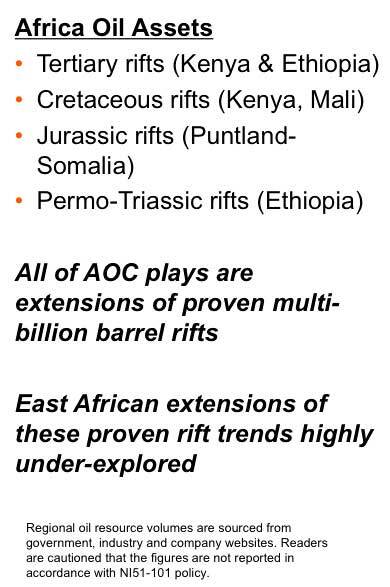 Cretaceous Rift Kenya Mali Sudan: Over 6 billion barrels of oil discovered on trend in the analogous system in Sudan. Thick oil stained section in the 1980s vintage Amoco/Total wells confirms hydrocarbon system. 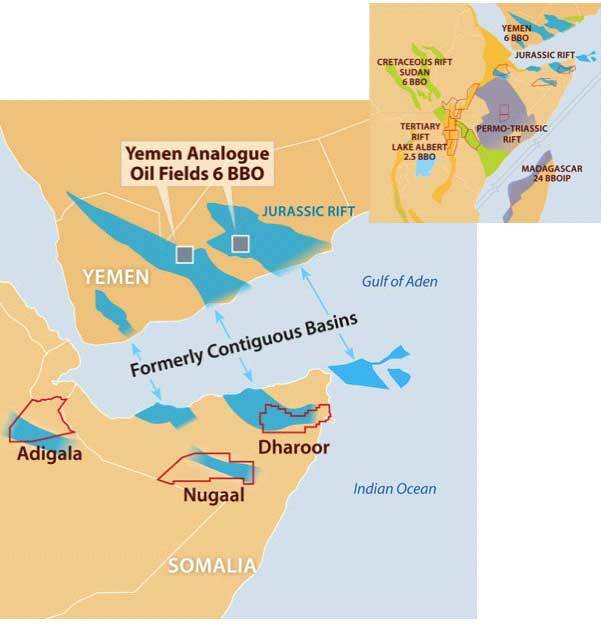 Jurassic Rift Yemen Somalia: Prolific, proven play in Yemen expected to extend into Puntland, which shares a common geologic history. Yemen fields produce from high quality Cretaceous and Jurassic reservoirs and source rocks. 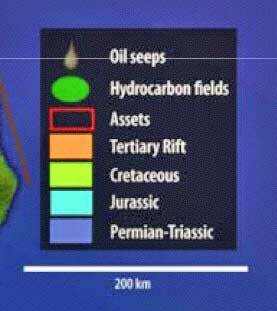 Numerous oil shows from wells drilled by previous operators confirm Jurassic source rock. Permo-Triassic Rift Ethiopia Madagascar: Multi-TCF gas reserves have been discovered in Triassic sandstones. Light oil has been tested in fractured Jurassic carbonates. 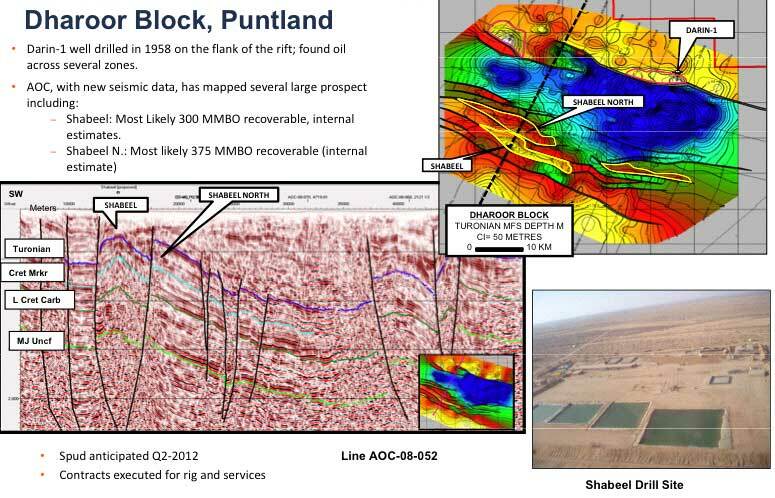 El Kuran field discovered by Tenneco in the 1970s confirmed oil and gas in both systems. Here is some detail of the Dharoor block in Puntland Somalia. 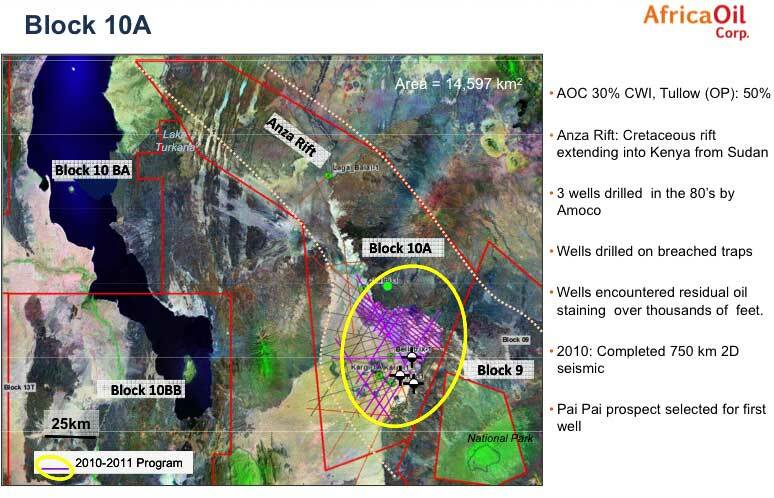 Here is some detail on Block 10A in Kenya where they are beginning to drill. 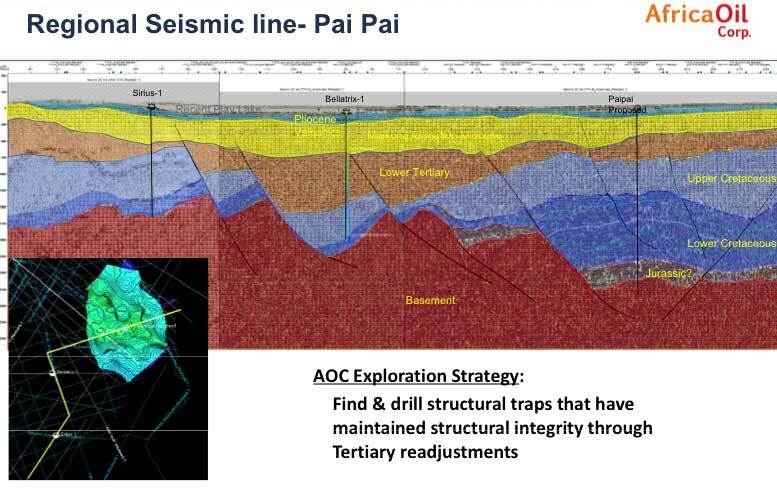 A seismic cross section of the Pai Pai prospect, site of drilling in Block 10A. 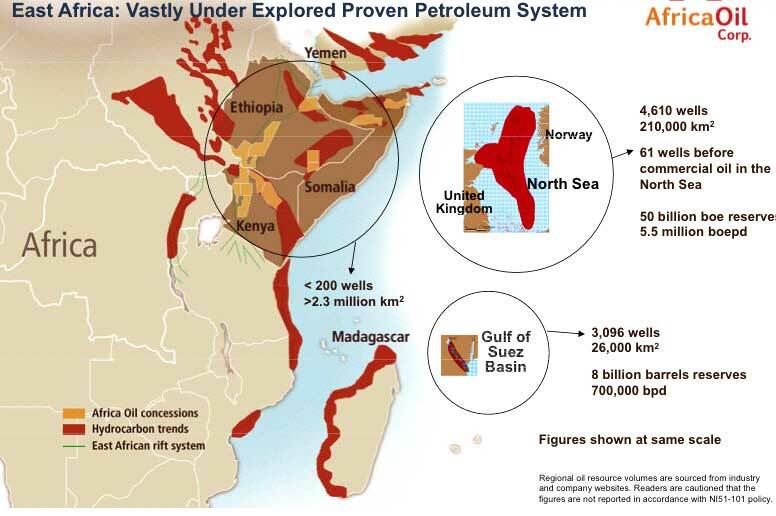 A map of East Africa suggesting the underlying petroleum system. 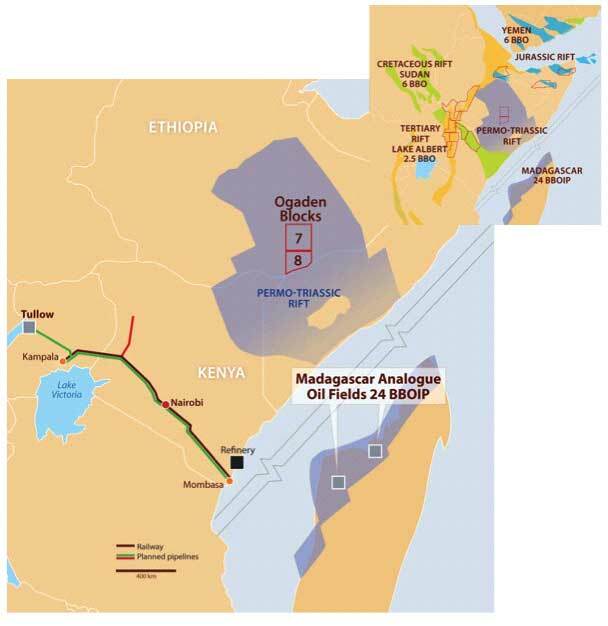 These are the local totals for potential barrels of oil that Africa Oil Corporation expects to be able to recover from Kenya, Ethiopia, and Puntland in Somalia. 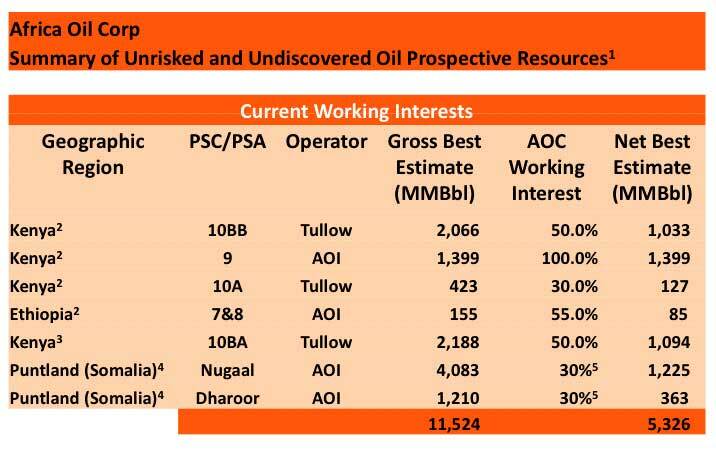 This is the total size of the potential oil prize in both barrels of oil and dollars. There is no certainty that any portion of the resources will be discovered. If discovered there is no certainty the the discovery will be commercially viable to produce any portion of the resources. All of these countries and locations mapped are of interest to the United States and its Africa Command, AFRICOM. Many aspects of that interest have been covered here in this blog. 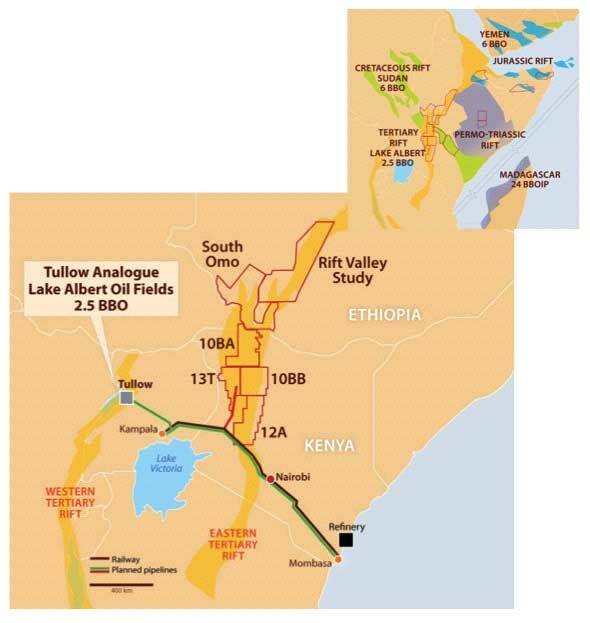 These earlier posts, along with their comments, are particularly relevant to East African oil. Uganda – Oil Reserves To Rival Saudi Arabia? The coup in Mali appears to be over, and President Blaise Compaoré of Burkina Faso is leading talks on how to organize and move forward. “Former parliament speaker Dioncounda Traoré was sworn in on Thursday as interim president after Amadou Toumani Touré resigned under the 6 April agreement. The 70-year-old mathematician turned politician is expected to name a prime minister soon, and to organise elections within 40 days. The following interview with Andy Morgan from March 27 provides knowledge, history, and insight regarding what is going on with the Tuareg uprising in Mali. “Q: Could you give us the general picture of what is going on in Mali at the moment? Q: What about the AQIM (Al Qaeda in the Islamic Maghreb)? Does this group exist and are there any links with the MNLA as some have suggested? Here is the map of Mali from near the end of March. Iyad’s creation of Ansar Eddine and his reported ties with a certain Abou Abdelkarim aka Le Targui, one of the minor AQIM leaders operating in the southern desert, have opened the flood gates to national and international speculation about the possible links between the Tuareg rebel movement and Islamic terrorists, a link that the Malian government is all to keen to stoke and publicise in order to discredit the movement. As his name indicates, Abdelkarim le Targui is supposedly a Tuareg, a native of the Tinzawaten region and the erstwhile preacher at the mosque in In Khalil, a remote and fairly lawless border town in the far north east of Mali. He is reportedly a subordinate of the thuggish emir Abou Zeid, and leader of his own small katiba called Al Ansar which was responsible for kidnapping the septuagenarian French humanitarian worker Michel Germaneau in 2010. According to an announcement by Abdelmalik Droukdel, until recently the supreme leader of AQIM, which was posted up on the AQIM website, Abdelkarim Le Targui was also responsible for murdering Germaneau in cold blood as well as negotiation major drug deals on behalf of AQIM with the representatives of a Colombian drugs cartel in Guinea-Bissau. Not the kind of person you should be associating with if you want to present yourself as a legitimate political organisation. Iyad’s association with Abdelkarim Le Targui is vague and conjectural. Some Tuareg even argue that far from being a true targui, Abdelkarim is an Algerian Arab, like all the other AQIM leaders in the southern desert. Nonetheless this link, together with the perceived religious extremism of Iyad and his Ansar Eddine movement, has spawned a smear campaign in Bamako which aims to convince the world that the MNLA are in cahoots with AQIM. The AFP reporter in Bamako even claimed that Abou Zeid took part in a recent MNLA attack on the army in the village of Aguel’hoc north of Kidal. Nothing is more poisonous to the international image of the Tuareg cause than this taint of fundamentalism and AQIM, not even the Gaddafi links. Far fetched? Maybe. Like Professor Jeremy Keenan’s controversial theory that AQIM are a creation of the Algerian DRS, the Mali-AQIM collusion theory remains conjectural. But the circumstantial evidence that links a cabal of Malian army and secret service operatives, usually Arabs from the north of the country close to the upper echelons of Mali’s political and military hierarchy, to the huge drug smuggling operations that have blighted the stability of the northern deserts in recent years and to AQIM is very strong. It’s hardly a secret anymore that a consensus exists among US, French and Algerian diplomats in the region that Mali has been long on words but short on action in its dealings with AQIM since 2006. The frustration with Mali’s lack of firm resolve and decisive action in this regard, despite the millions of dollars in aid that it has received from the US and France specifically for the purpose of fighting terrorists on its soil, has been growing exponentially in the embassies and foreign ministries of the world powers. Apart from one clash with AQIM in the desert north of Timbuktu back in 2006, there have hardly been any confirmed reports of the Malian army doing any damage to AQIM at all. In fact, the most determined opposition that AQIM has encountered during its five year campaign of terror in Mali has been at the hands of the ADC, the Tuareg rebel movement launched in 2006, who skirmished with the terrorists several times between 2006 and 2009, with lives lost on both sides. And now that the entire might of the Malian army has been thrown against the Tuareg uprising with such devastating force, including fighter jets, tanks, armoured vehicles, missiles of every stamp and thousands of troops, it’s little wonder that Tuaregs, diplomats, analysts and commentators are feeling a tad cynical about Mali’s repeated assertions in recent years that they’ve never had the military wherewithal to deal with the AQIM threat. A senior Malian politician once had the temerity to declare in a private meeting at the US Embassy in Bamako that the presence of AQIM in the north east of the country was a good thing, as long as it meant that the Tuareg rebel movement wasted its resources and time trying to combat it. At another meeting, the new Algerian ambassador informed his US counterpart that he suspected collusion between Mali and the terrorists. He cited the then recent case of a joint Algerian-Malian operation to attack an AQIM base that had failed because the AQIM katiba in question had been tipped off in advance. All these frankly startling revelations are contained in the US Embassy cables leaked by Bradley Manning and Wikileaks. In fact, there is no better way to understand what really went on in the northern deserts of Mali between 2006 and early 2010 than to read those US Embassy cables. The level of intelligence, analysis and research contained in them is often of the highest order. And yes, they do reveal that the US Embassy has also suspected Mali of at best tolerating and at worst colluding with AQIM at one time or another. If the implantation of AQIM on Tuareg soil was part of a deliberate Malian strategy, then it has been extraordinarily effective. The main campaign of AQIM kidnapping and extortion began in March 2008 (interestingly there had been a five year hiatus since the 2003 hostage incident), just when relations between Mali, the ADC and Ag Bahanga were reaching their nadir. Since that time AQIM has knocked the Tuareg rebellion squarely off the front page, both national and internationally. Until January 17 of this year that is. The presence of AQIM in Mali put the country in the front line of the USA’s global war on terror, giving it kudos and a receptive ear in Washington whilst justifying the huge amounts of money, training and equipment that America lavished on Mali in the context of its Trans-Saharan Counterterrorism Programme (TSCTP) and Pan Sahel Initiative (PSI). It has also emptied the north of foreign journalists, foreign observers, foreign NGO workers, foreign tourists and foreigners in general, whose presence could have been inconvenient for certain shady army or secret service (DGSE) operations, especially those linked with the drug trade. Most of all, AQIM have simply throttled the region and deprived its Tuareg population of any hope of building a viable future and developing a strong economy. In short, AQIM has crippled Tuareg society in Mali’s north east. No wonder MNLA have vowed to rid their land of Al Qaeda. Agree, the operations of AQIM appear focused on running blackmarket opperations (smuggling, drugs, money-laundering & protection rackets). It appears to me AQIM does not want witnesses, foreign observers, especially those trusted by locals. Leggett and the three Spanish aid workers were neither political targets nor ransom targets (corporate engineers/execs). Outsiders who are trusted by local residents might bring back reports of what is really happening. Those with a political agenda might want the outside to know of their deeds when they are effective. They may have less to hide. Those with a criminal agenda might want to prevent any whiff of real information from reaching the wider world. They may have much more to hide. Here is more from the interview with Andy Morgan in Global Dispatches on the subject of Mali’s Tuareg Rebellion. “From about October 2011 onwards, they basically started preparing the uprising, with long meetings out in the desert where they indulged in a great deal of soul searching about what had gone wrong in previous uprisings, so as to get it right this time. What happened is that they entered into an alliance with a much younger group of Tuaregs, you might say young intellectuals, very Internet savvy young Tuaregs, who set up the National Movement of Azawad, the MNA at the end of 2010. They eventually merged with the MNLA. This was an important move as one of the aspects that was deemed to be lacking in previous uprisings was good communications with the international media, and with the world at large. Q: When we talk about Tuaregs we are talking about many different tribes, spread over different countries. Some say the MNLA is just a small group of a few thousand fighters. What sort of support does the MNLA have from Tuaregs as a whole? A: There are roughly 1.5 million Tuaregs, although an accurate census does not exist. They are spread out over 5 countries: Mali, Algeria, Libya, Niger and Burkina Faso. They have a very complex clan and tribal structure, at the top of which you have 5 large confederations which are then broken down into tribes, then clans and families etc. It’s very complex. They don’t all see eye-to-eye and historically they have fought against each other, sometimes very bitterly. The idea of a Tuareg identity is a relatively recent phenomenon. Up till about 50 years ago, they did not see themselves as a unified people, they saw themselves as different families, tribes and clans – nomads from different parts of the desert who often fought against each other. Q: So who are the MNLA? A: The MNLA are basically led by Tuaregs from the north-east of Mali, especially by two particular clans, called the Iforas and Idnan. The Iforas are the traditional rulers of north-eastern Mali. The Idnan are also a traditional warrior clan, bearing in mind that their society is very hierarchical and each clan had its different role. All of these old structures have been modified and deconstructed over the last one hundred years, but basically these two groups, the Iforas and the Idnan, are very much at the head of the MNLA. Support for the MNLA amongst Tuaregs is quite broad, partly as a result of the MNA’s propaganda and certainly before this latest conflict happened, I got the feeling from talking to various friends, that a lot of Tuaregs felt that at last they had a rebel organisation that was worthy of their cause. However they do not represent all Tuaregs by any means, and even less, all the people living in the north of Mali, where there are quite a number of different ethnicities apart from the Tuareg, including Arabs, Songhai and Peulh. All I can say is that it’s been along time since a rebel movement has enjoyed the level of support that the MNLA have, but this support is by no means universal. Q: Is there any internal opposition? A: There is one group that is seemingly opposed to the MNLA and they are called the Inghad. They are the former subordinate or ‘vassal’ class in the old hierarchical structure, subordinate to the more noble Idnan and Iforas Tuaregs. Many of the Inghad were in favour of the Tuareg lands becoming part of the Republic of Mali, as the socialist principles upon which the Malian Republic was built meant that they were freed from their subservient status in Tuareg society. One of the most frequently touted names in this conflict is a Tuareg military commander called Colonel al-Hajj Gamou. He has been the Malian army’s champion in the north-east for quite a number of years and he is an Inghad, from one of these vassal tribes. Ag Gamou has been built up as the defender of the Malian cause in the north. Apart from the Libyan Tuareg presence in the MNLA, there have also been a lot of desertions to the MNLA from the Malian army since December, as the Malian army did comprise a large number of Tuaregs. The actual number of people in the MNLA is difficult to gauge but I am sure that the numbers are growing. Q: What are the aims of the MNLA? A: They want a country of their own, a country called Azawad, which will comprise the three northernmost provinces or regions of present-day Mali – Timbuktu, Gao and Kidal. There has long been a debate within Tuareg society about what they want; autonomy within a federalist Malian structure or a completely independent state. After the last big rebellion in the early 1990s, when the suffering among the civilian population was quite extreme, many Tuaregs fell back to a more conciliatory position, saying that they did not want an independent country but wanted their rights; cultural rights and economic rights. This position has hardened in recent years to the point where the MNLA want absolute independence for Azawad, the long-dreamed-of Tuareg state. Morgan continues to describe in more detail why the nearby countries are extremely nervous about the situation. He speaks about the reasons for the coup, and the very real grievances the Malian military had against their government. He discusses the origin and nature of Ansar al Din, and the links and frictions between it and the MNLA, and the AQIM. Morgan describes how AQIM’s kidnapping and drug running destroyed tourism and related business in northern Mali. This led to bad feelings towards AQIM. Morgan discusses how during peaceful times, Malians and the Tuareg generally get along pretty well. And he discusses the tensions between Mali and Mauritania. “I have been expressing concern for Tuareg for several months. My research uncovered two parallel movements. One, a genuine uprising of the Tuareg. The other, an imperialist-backed initiative aimed and manufacturing consent for the takeover of another African nation and the genocide of the Tuareg. “The conflict in Libya has had a devastating effect in Niger and Mali where the nomadic Tuareg peoples in the Sahara Desert regions of northern Niger and Mali and southern Libya have been involved in a spate of kidnappings and armed uprisings known as the ‘Tuareg rebellion’. This is especially dangerous for northern Niger in and around the town of Arlit, an industrial town located in the Agadez region, where uranium is mined by French companies in two large uranium mines (Arlit and Akouta). “Q: What about oil and gas? Is the area strategic in terms of its mineral resources? 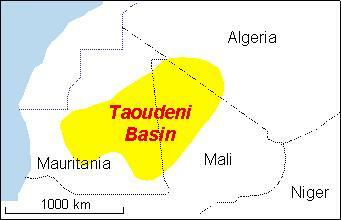 The Taoudeni Basin in Mali, which extends far into Mauritania, and somewhat into Algeria, is thought to be the location of significant reserves of oil. MNLA : « L’indépendance ne se donne pas, elle se mérite, google translation here. Mossa Ag Attach, communications officer for the MNLA tells us in the interview that the MNLA is determined to control (free) the three northern cities, Kidal, Gao, and Timbuktu. He indicates the MNLA is happy to negotiate so long as the government of Mali will respect Azawad independence. You can check for more from the source at the MNLA website. The international community is hyping the threat of terror, linking it to the Tuareg victories in the north of Mali. But if Mali’s army and political elite have been a more active partners and participants with AQIM’s drug smuggling and criminal endeavors, the Tuareg may make life more difficult for AQIM, and cost some big people money. Also, how does the quest for oil and uranium interact with AQIM’s criminal endeavors? 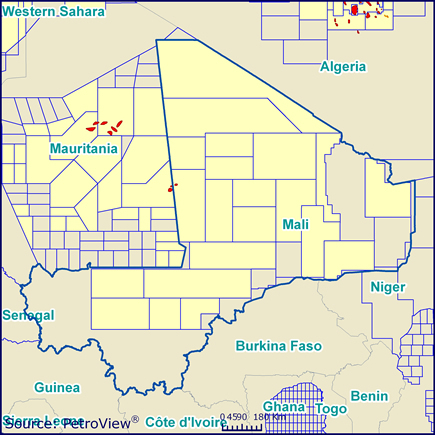 The north of Mali is hostile and unfamiliar to soldiers from the south. ECOWAS has spoken of sending troups, but getting actual troop commitments is chancy, and no way guaranteed. If the upper echelons of Mali’s army and political elite are allied with AQIM, and the US knows this, then all the train and equip is another example of the US knowingly partnering with the perpetrators, and actively concealing the truth. What is the goal of such a policy? 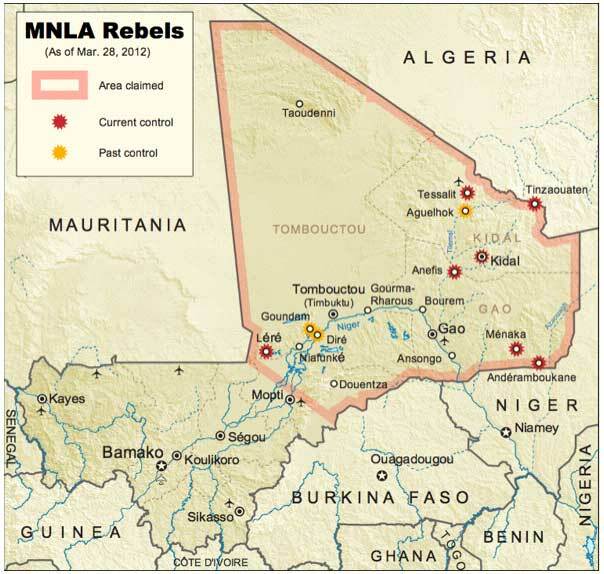 Be sure to read the entire article, The Causes of the Uprising in Northern Mali by Andy Morgan. I only included a small portion here. He covers many more aspects of the recent history and the present situation. Check the interview as well Mali’s Tuareg Rebellion. AFRICOM’s train and equip undoubtedly helped facilitate the coup in Mali. Train and equip was a contributing cause. Just the fact that the coup leader, Captain Sanogo received US training and attended the infamous coup school in the US at Fort Benning makes this an issue. Whether train and equip played a large part or a tiny part in the coup is hard to say at this point, but it certainly played a part. US train and equip has a long and ugly history in Africa, and in Latin America. However, Pentagon apologist Wendy Sherman alleges that train and equip is the cure to events such as the coup in Mali, not the cause. 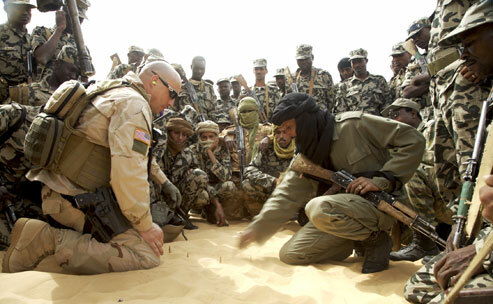 A U.S. Special Forces soldier instructs Malian troops in counterterrorism tactics through a translator (right, in black turban) on the outskirts of Timbuktu in 2008. Photographs by Justin Bishop. Ambassador Sherman was recently named to the U.S. Department of Defense’s Defense Policy Board, where she is tasked with advising the Secretary of Defense on matters of defense policy. In 2008, she was appointed by Congressional Leadership to serve on the Commission on the Prevention of Weapons of Mass Destruction Proliferation and Terrorism. A seasoned strategist and organizer, she is skilled at engaging stakeholders and building broad coalitions. Ambassador Sherman serves as a frequent analyst in major news outlets, providing unparalleled insight and perspective on today’s most complex issues. This ruinous history, just from the train and equip in Liberia alone, is still playing out. When Ivory Coast fell into conflict following the most recent presidential election, former soldiers from the Liberian and Sierra Leonean civil wars of the 90s headed to Ivory Coast looking for work in what appeared to be a coming civil war. When you invest all your attention and resources in the military sector, the message you send is that the military sector is best qualified to run things. And US investment in Africa is almost entirely military. I’m sure Ambassador Sherman would point with pride to programs such as AGOA, or some of the agricultural programs, which mostly benefit US corporations, and harm, or potentially cause great harm, for Africa. I do not think AFRICOM’s train and equip was the main cause of Mali’s coup. I don’t know, and have no particular reason to believe there was any US instigation in the coup, although it is possible. Malians, and Mali’s military had many reasons to be angry with their government. Q: What are their grievances? A: The conduct of the war against the MNLA has in their eyes [Mali’s soldiers] been a thing of shame. They feel the army is underfunded, undersupplied and there are stories of soldiers almost dying of hunger because of not getting enough food. There was also supposedly a massacre of Malian soldiers in a village north of Kidal called Aguel’hoc, which the Malians claim was perpetrated by AQIM (Al Qaeda in Islamic Maghreb) but the jury is out on what actually happened. But in Bamako, people certainly believe that the soldiers were badly treated and brutally murdered in Aguel’hoc. The Malian army also suffered some serious defeats a couple of weeks ago, in Tessalit, which is up near the Algerian border. The MNLA captured a lot of soldiers, and the head of the MNLA, Mohamed Ag Najm, in an interview with El Watan, the Algerian newspaper, said that the MNLA had tried to hand back the soldiers to the Malian authorities but that Mali did not seem to want them. So there is also the feeling that the soldiers are being abandoned. There is a lot of anger and this anger has clearly boiled over. The big question is “Who is behind this putsch?” The leader of this little junta, Captain Sanogo, is a complete unknown, although he has fought on the frontline and has experience of the north-east. Whenever he and his junta make declarations on the TV, it is clear that there are no senior officers involved in this coup at all – no-one above the rank of captain. I think it is generally accepted that when there is a military coup in an former French colony, the French army have got something to do with it, or at least some prior knowledge, as the links between the armies in Mali and Senegal for example and the French army are very close. Most senior Malian officers will have been trained in French military academies. It is possible that this coup may be the exception and that it is being led by a group of fairly young junior soldiers who are clearly very angry. It looks like they have taken over but it is not clear if the rest of the army has gone over with them. The jury is completely out on this, we will see how this situation develops. Whatever the relationship between the coup makers and AFRICOM, key players have received US training. She is claiming a cause of the problem is the cure for the problem. It is hard to say whether the most appropriate response to that claim is apoplectic outrage or gales of laughter.